In this article we will discuss Junit and its implementation in java. JUnit is an open source unit test framework for Java programming language. It is a useful for both types of developers who use the test driven development (TDD) methodology and who don't use TDD. JUnit is a part of the unit testing framework family - xUnit. JUnit not only increases the productivity of the developer but also increases the stability of the program. If each of the methods of a class are unit tested with all possible test data, there is a very less that the code will produce any defect or bug. In the modern era, where every project is challenging in all aspects, JUnit has become an essential part of day to day development. Many customers want their applications to be developed in test driven development environment. Testing via main doesn't have a concept of pass or fail. Developers use debug statements (System.out.println) to actually check the result of the program. There is no mechanism to collect the results in a structured fashion. After each run the developer has to manually check the results. In a web based application, JUnit is mainly used to test the DAO layer as these classes can be executed without any application server. We can test Struts/Spring based application also. At times service classes are also tested using JUnits. With the help mocked objects, (jmock framwork) JUnit helps a developer to test the different tiers of the application even when the tiers are not integrated, thus Junit helps to identify the defects at a much earlier stage. Application server is not required in order to execute a JUnit test case. JUnit is an open source framework used for writing & executing unit test cases. JUnit identifies the test methods using annotations. JUnit tests the expected results using the assert method. JUnit helps in faster development with increased quality. JUnit is simple and can be developed in less time. JUnit tests can be run automatically. These tests check their own results and provide immediate feedback. These tests can also be organized into test suites consisting of multiple test cases. Junit shows the result in a progress bar. This bar is green if test is goes fine and it turns red when a test fails. Junit can easily be integrated with standard IDEs e.g. eclipse, netbeans etc. Eclipse creates a source folder - src by default. Create another source folder - tests. 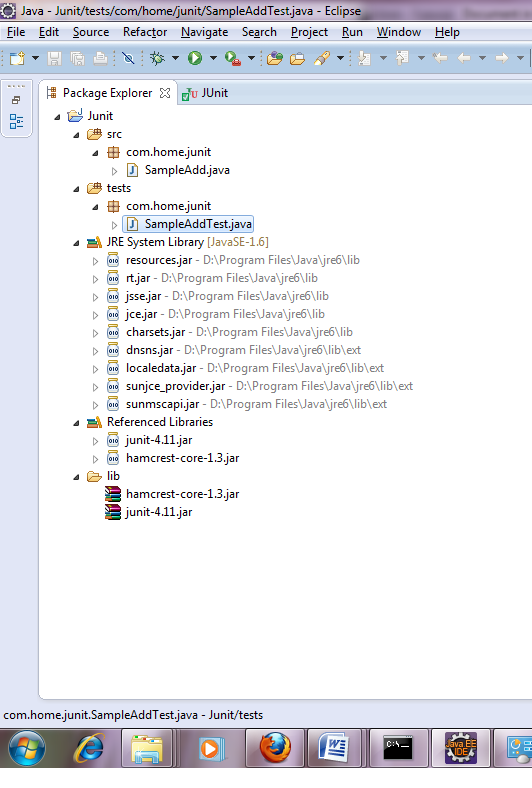 This folder will store the Junit classes while the src folder would store the java classes. Create another folder - lib. This folder would store the above mentioned two jar files and any other jar file required in the project. Create the package - com.home.junit within each of the source folders - src & tests. Add a java file - SampleAdd under src. Within this add a method to add two integers. Add another java file - SampleAddTest within test. Figure 1: A sample Junit project in eclipse. @Beforepublic void method () This executes prior to the execution of each test method. Used for initialising the objects required for the execution of the test method. @Afterpublic void method () This executes after the execution of each test method. Used for releasing the objects which were initialised in the @Before method. @BeforeClass public static void method() This method is executed once, before the start of all tests. This can be used to perform activities like connect to a database, load properties file etc. Methods using this annotation need to be defined as static to work with JUnit. @AfterClass public static void method() This method is executed once, after all the tests are executed. This can be used to perform activities like close the DBConnection, relese other stream resources etc. Methods using this annotation need to be defined as static to work with JUnit. @Ignore Used to indicate that the test method would be ingnored. Very useful in the test driven development methodology. @Test (expected = Exception.class) Fails if the method under test doesn't throw the said exception. @Test(timeout=100) Fails if the method doesnot responds within 100 msecs. fail(String) Let the method fail. Used to check if a certain part of the code is not reached. Usefull for TDD as it fails before the test code ins implemented. assertTrue([message], boolean condition) Checks whether the boolean condition is true. assertsEquals([String message], expected, actual) Checks that two values are the same. assertsEquals([String message], expected, actual, tolerance) Checks whether two float or double values are same. Tolerance is the number of decimals which should be the same. assertNull([message], object) Checks if the object is null. assertNotNull([message], object) Checks if the object is not null. assertSame([String], expected, actual) Checks if both variables refer to the same object. assertNotSame([String], expected, actual) Checks if both variables refer to different objects. Consider the scenario where there are multiple test cases and all of them needs to be executed in one go. These test methods can be combined into a single test suite. Once the test suite is executed, it will run all the test cases in one shot. Junit is a unit test framework for java developers. It helps to identify the defects in the intial stage of development. It is very useful in environment where TDD is followed. Test cases executes via the different assert methods. Multiple test cases can be clubbed into one single test suite.